Action Training (Stoke) Ltd is an accredited training provider for Edexcel/Pearson. Under the accreditation criteria, we are subject to annually inspections and continuous monitoring to ensure that the training we provide is the best it can be. Action Training (Stoke) Ltd has been an Edexcel/Pearson centre for over 10 years and pride ourselves on a 100% clean audit record. ITSSAR (The Independent Training Standards Scheme and Register) have been a recognised awarding body since 1991. Under ITSSAR, we offer training that meets all of the requirements set out within the Approved Code of Practice (ACOP) which means you can rest assure that your training will give you all the skills needed to be a successful and competent operator. ITSSAR is also a member of the ABA 2012 (Accrediting Bodies Association) along with RTITB, NPORS (National Plant Operators Registration Scheme) and AITT (Association of Industrial Truck Trainers). The ABA was formally to ensure a standardised scheme of work for training was set out; therefore you can rest assured that gaining an ITSSAR certificate would not mean you have missed anything out that a RTITB certificate would have. Ofsted is more commonly known for inspections schools; however they also have a responsibility to inspect any company that offers training or qualifications. In January 2008, Action Training (Stoke) Ltd was inspected and we are pleased to say we were awarded outstanding: grade 1. This means that we offer the best possible training and that Ofsted agree. 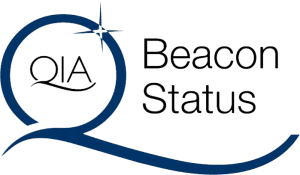 Action Training (Stoke) Ltd has also been awarded the Beacon Status and was one of the first of its kind to do so. The Beacon Status award congratulates learning providers that deliver outstanding teaching and learning and are well led and managed. Derek Foster, Managing Director, has also been awarded a MBE for the work he and Action Training (Stoke) Ltd has done in the lifelong learning section. A MBE is awarded by the queen and is recognised for outstanding services to the community or local “hands on” service.